This is an 1865 issue of “Military Map Showing the Marches of the United States Forces under the Command of Maj. Gen. W.T. Sherman” which covers the years of 1863, 1864, and1865. Engraved at Head Qrs., Corps of Engineers, by H. C. Evans & F. Courtenay, this map was printed by Joseph F. Gedney in St. Louis, MO. The map is a detailed look at the southeastern United States, showing fortifications, and troop movements under Major General Sherman. This includes movements of Genl. J. H. Wilson's Cavalry Corps, the "pursuit of Hood," and the lines of march of the 4th, 14th, 15th, 16th, 17th, and 20th Army Corps and Cavalry. There is extensive detail in the movements on Atlanta, GA, as well as Sherman’s famous “March to the Sea” campaign. Roads, railroads, geographical coordinates, topography and drainage are all indicated- a beautiful illustration of the many geographic and infrastructure considerations that Sherman had to take into account for his marches to be successful. The map summarizes the entire Atlanta campaign, from Sherman's initial clashes with Joseph E. Johnston's army of Tennessee to the final Confederate resistance under General John Bell Hood. 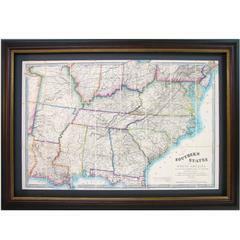 This cartographic study takes the viewer from Alexandria to Savannah, from Memphis, Vicksburg, and Nashville to Atlanta. 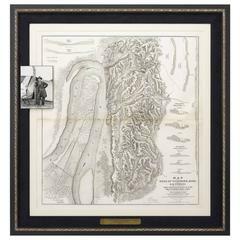 The map is beautifully framed with a photograph of the famous Union general in the upper right. 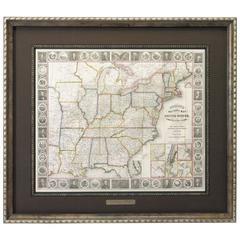 The presentation is archival and to the highest conservation standards and consists of a black top mat and custom beaded gold and black frame. Framed dimensions: 39" H x 57" W x 2 1/4" D.
Militia sword from U.S. military, circa 1830s-1850s.